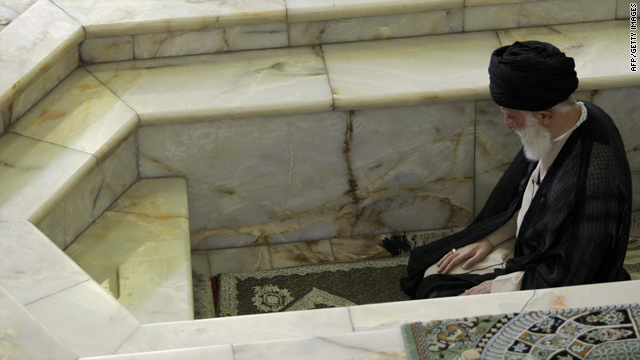 Iran's supreme leader Ayatollah Ali Khamenei leads the weekly Muslim Friday prayers at Tehran University on June 19, 2009. He says festivities have no basis in Islam and can cause "harm and corruption"
Tehran, Iran (CNN) -- Iran's supreme leader is attempting to extinguish an annual event celebrating the last days of winter and the Persian calendar year, and the government is strengthening its security presence in the days leading up to a major holiday, Iranian media reported. Ayatollah Ali Khamenei on Sunday urged Iranians to dismiss the ancient practice of fire jumping and feasting on Chaharshanbe Soori, a festival held on the eve of the last Wednesday before spring -- this year, March 16. The activities date back thousands of years. The festivities have no basis in Islam, and can cause "harm and corruption," Khamenei said in a statement published by Iranian news sites. "It is appropriate to avoid it," he said. The celebrations lead up to Norooz, the holiday that marks the first day of spring and the Persian new year. Norooz falls on Saturday this year. Iran is beefing up security to ensure "order and calm" during the two-week period celebrating Norooz, stationing 200,000 security personnel across the Islamic republic, according to Raja news, the official new site of Iranian President Mahmoud Ahmadinejad. In the eastern city of Mashad, the chief prosecutor said those who engage in "disruptive behavior" during Chaharshanbe Soori would face "strong consequences." Most recently, the Iranian government quashed anti-government protests that brewed in February as the nation commemorated the 31st anniversary of the Islamic Revolution, which marked the end of the country's Western-backed monarchy and the start of an Islamic republic. In the days that led up to the February 11 holiday, the government mobilized security forces and heightened its warnings, saying it would arrest protesters and hold them until the April 9 end of Norooz. And some 350 inmates at Evin prison have gone on hunger strike to demand that their cases be examined before Norooz, saying their ward is so overcrowded with recent political arrestees that prisoners are in poor health, according to the Committee of Human Rights Reporters, an Iranian group. There were also reports that opposition leader Mehdi Karrubi's home was vandalized. Karrubi's Eetemade-Melli (National Trust) party's Web site, called Saham News, said a group had gathered in front of his house and tossed red paint on the walls of the apartment building. Two weeks earlier, a similar group threw tomatoes and eggs at the building, the Web site said. A video identifying a vandalized apartment building as Karrubi's was posted on YouTube Monday, showing exterior walls scrawled with the last names of Karrubi, fellow opposition leader Mir Hossein Moussavi and former President Mohammad Khatami -- all reformists. In some areas, the black spray paint read "death to Karrubi" and "death to Khatami." Eyewitnesses in Iran said thousands of riot police and security officers lined the streets of the capital, Tehran, and patrolled major intersections on motorcycles and on foot Monday night. Beginning Saturday, police also set up checkpoints along major roads in Tehran, and vehicles have been stopped and searched from late at night into the early morning hours, witnesses said.